Exercise Coastal Response will help the province prepare for a disaster. Now it's time for families to do their own emergency preparedness. Friday, June 10 marks the final day of Exercise Coastal Response that took place over three days in the Alberni Valley. Canada’s first, full-scale earthquake and tsunami response exercise involved stakeholders from all levels of government as well as Emergency Management BC staff, First Nations, Crown corporations, critical infrastructure owners and non-government organizations involved in provincial-level response. All groups collaboratively work to respond to the impacts of a catastrophic event along coastal B.C. The exercise was executed to test the elements of the B.C. Earthquake Immediate Response Plan. The B.C. Earthquake Immediate Response Plan is the first component of a comprehensive provincial plan for earthquake response, and it sets the conditions for the subsequent planning efforts. Yamamoto said there’s a one in three chance that in the next fifty years there’s going to be an earthquake. The B.C. government has invested $1.2 million into Exercise Coastal Response. 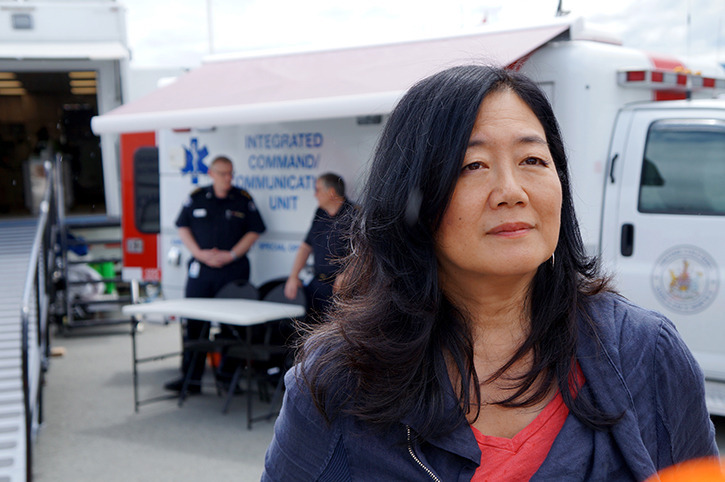 “This is a good test of how prepared we are in terms of emergency responders but we’re really concerned that the majority of British Columbians aren’t as prepared as they could be. That means not just having an emergency kit at home it means having an emergency plan,” Yamamoto said. Tofino mayor Josie Osborne agrees that both families and communities need to be prepared for a major earthquake and should start with a 72 hour plan. Families and individuals can find a guide on the PreparedBC website that outlines appropriate emergency preparedness plans.